Mired in another disappointing season, the Seattle Mariners' best player in the history of their franchise has decided to hang them up. M's skipper Don Wakamatsu announced before tonight's game against the Twins that Ken Griffey Jr is retiring, effective immediately. There is a lot that can be said about Griffey's return to the Mariners for his swan song. For example, it was an irresponsible waste of money by Seattle. 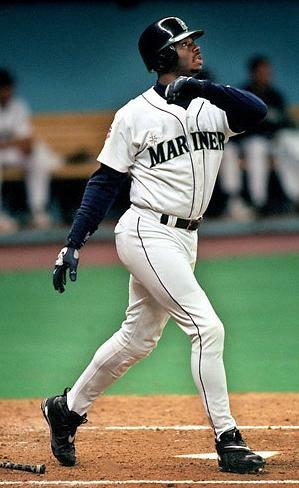 Griffey was having a miserable season at the plate this year hitting .184/.250/.204 and even missed a pinch hit opportunity while napping in the clubhouse. And while I could make old jokes all day, I think today it would be better to just honor the man. After all, if it wasn't for the nagging injuries that marred his late career, Griffey would have easily been a top five player of all-time. Let's take a look at some of the numbers courtesy of the fine people at Baseball Reference. Griffey hit 630 homeruns, good for a solid 5th place all time and will probably only be caught by Alex Rodriguez and maybe Albert Pujols. His career slash line is an impressive .284/.370/.538 that had some damage done to it over his final seasons. The number one overall pick in the 1987 draft finished in the top ten of MVP voting seven times. Griffey won the AL MVP in 1997 while hitting 56 homeruns and .304/.382/.646. He had an even better season in 1994 when hit 40 homeruns and .323/.402/.674 (finished 2nd in MVP voting to Frank Thomas. Thomas hit 38 homeruns and a whopping .353/.487/.729. Insane). So tonight, I'll raise a glass and toast to the Hall of Fame career of Ken Griffey Jr.